Echoviruses are the commonest cause of aseptic meningitis. Echovirus type 13 which has not been isolated in Germany over a long period of time was the predominant enterovirus serotype associated with different local outbreaks of aseptic meningitis in Germany in 2000. Virus isolation was performed from cerebrospinal fluid and stools. In order to study the genetic relationship of echovirus type 13 isolates, sequence analysis of a part of VP1 (~300 nt) was carried out. Isolates from different geographic regions were compared to each other as well as to elder viruses (prototype strain from 1953, four isolates from 1965–1986). Overall, 55 isolates of echovirus type 13 were obtained from different parts of Germany. It was shown that the new isolated strains have a very high degree of homology on the nucleotide level (> 98%)) but differ significantly from the old strains (76–85%). a) Rare enterovirus serotypes can cause serious illness. b) The molecular drift has also been shown for other enterovirus serotypes. The human enteroviruses, belonging to the family Picornaviridae, include more than 60 serotypes of closely related pathogens. Enteroviruses usually cause self-limited diseases that, although associated with high morbidity, are rarely fatal. The enteroviruses can cause a wide spectrum of human illness, from mild nonspecific fever to common upper-respiratory infections, aseptic meningitis, severe myocarditis, encephalitis, and paralytic poliomyelitis. Subgroups of enteroviruses include the polioviruses (3 serotypes), Coxsackieviruses A (23 serotypes) and – B (6 serotypes), echoviruses (28 serotypes), and the newer numbered enteroviruses (4 serotypes). After a new classification all human enteroviruses are divided into groups A-D .
Echoviruses have become the commonest cause of viral meningitis since routine vaccination against mumps was introduced, responsible for 80% of viral meningitis. In temperate climates, enterovirus infections are commoner in summer and autumn, which explains why notifications of viral meningitis increase each summer. The size of the increase varies each year, depending on the serotype of enterovirus infection that predominates. The variability of the increase of notifications with serotype does not compulsory imply a difference in disease severity. Compared to previous years a significant amount of aseptic meningitis cases has been notified in Germany in 2000. Local outbreaks occured in different geographic regions. Virological (virus isolation and/or typing) as well as molecular investigations were carried out. The first local outbreak of aseptic meningitis was notified from Saxony-Anhalt, starting in May 2000. Later aseptic meningitis was diagnosed in Saxony and other regions of Germany. Mainly children < 15 years were affected from aseptic meningitis. Most of them had fever, headache and other meningeal signs (vomiting, stiff neck) and were hospitalised for a short period of time (3–7 days). Viruses have been isolated from cerebrospinal fluid (CSF) and/or stool specimens by conventional cell culture methods using WHO recommendations . Viral isolation was performed on RD-cells (human rhabdomyosarcoma). In order to exclude the involvement of polioviruses L20B-cells (transgenic mouse cell with the human poliovirus receptor) were also used for virus cultivation. Cultures with an enterovirus cytopathic effect were typed by a microneutralisation assay using WHO poolsera as well as monospecific in-house rabbit antisera. Enteroviruses isolated at other laboratories from patients with aseptic meningitis as well as with other diagnoses were typed at the National Reference Laboratory for Poliomyelitis and Enteroviruses. Echovirus type 13 (ECHO 13) isolates from 2000 as well as elder viruses isolated between 1965 and 1986 and the prototype strain DelCarmen (AccNo. AJ 241427) were included in molecular studies (Tab. 1). The RNA was extracted from 140 μl of the supernatant of virus infected cell cultures by a spin column technique using the QIAamp Viral RNA Kit according to manufacturer's instructions (QIAGEN GmbH, Hilden, Germany). cDNA synthesis was performed with MMLV reverse transcriptase at 42°C for 1 h. The amplification was carried out in 35 cycles consisting of 30 sec at 94°C, 30 sec at 42°C, and 45 sec at 72°C. The PCR products were sequenced directly, using a dye terminator cycle sequencing kit (Perkin Elmer) and ABI Prism 377 DNA sequencer (Applied Biosystems). For the analysis of molecular characteristics of the ECHO 13 strains sequence data encoding the capsid protein VP1 (~300 nt) were used. Primers used for cDNA synthesis (222), PCR (187–222) and sequencing (187) are described by Oberste et al. . The analysis of 100 bootstrap resamples of the alignment data sets was performed using PHYLIP. The sequences described here have been deposited in the GenBank database under accession no. AF401353 to AF401360. The mainly cytopatic agent recovered from stools or CSF of patients with aseptic meningitis in 2000 could be typed as ECHO 13. The first isolates were received from an outbreak of aseptic meningitis in Saxony-Anhalt. Later this serotype has been found in Saxonia and other parts of Germany (Saarland, Baden-Württemberg, Bavaria, North-Rhine Westphalia, Mecklenburg-Vorpommern). Furthermore, ECHO 13 could be typed from patients with other clinical diagnosis. Overall, 55 isolates of ECHO 13 (37× meningitis, 2× facialisparesis, 1× enteritis, 1× acute flaccid paralysis, 14 unknown diagnosis) were typed during the year 2000. Other frequent enteroviruses isolated from cases of aseptic meningitis last year were ECHO 30 and ECHO 6 (Tab. 2). The proportion of ECHO 30 was very high, but no meningitis outbreaks were reported. No mixed infections were found in outbraeks or sporadic meningitis cases in 2000. The total number of enterovirus isolates with determined serotype was 161. Pairwise comparison of sequence identities of a part of VP1 gene of four new ECHO 13 strains shows a high degree of homology (98,6–100% at nucleotide level and 100% at amino acid level). The homology between the new and old ECHO 13 strains was significantly lower (75,9–85,0% at nucleotide level and 90,5–94,7% at amino acid level). The unrooted phylogenetic tree derived from nucleotide sequences of the VP1 shows that all new ECHO 13 strains are clustered phylogenetically together with some genetic distance to the elder isolates as well as the prototype strain (Fig. 1). 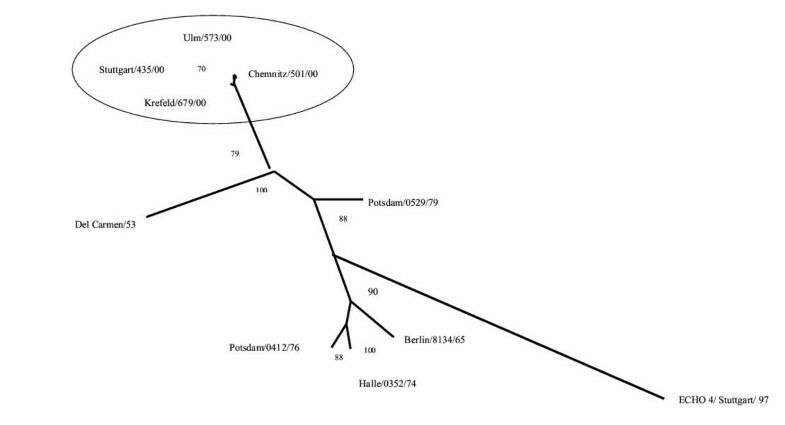 Phylogenetic tree based on sequences from VP1 capsid protein showing genetic relationship between recent isolated and elder echovirus type 13 strains. For comparison echovirus type 4 (accession no. AF132497) has been included. The phylogramm was generated by using PHYLIP. Regarding to an infectious disease regulation cases of aseptic meningitis in Germany were reported to the Robert Koch Institute until the year 2000 (Fig. 2). Compared to previous years there was an increase in notifications of aseptic meningitis cases in Germany in 2000. Local outbreaks of meningitis were reported from several regions. For example, Saxony-Anhalt reported 164 cases (incidence 6,2 per 100.000 population), Saxony-208 cases (incidence 4,7), Bavaria-258 cases (incidence 2,1). These cases were caused mainly by ECHO 13 which apparently did not circulate in the area over a period of > 15 years and thus perhaps was capable of causing widespread infections. Meningitis outbreaks due to ECHO 13 have never been described in Germany before. 55 isolates of ECHO 13 were typed during 2000 but the real number was much higher. There were about 80 further enterovirus isolates from patients with meningitis which were not typed but linked to other patients with aseptic meningitis caused by ECHO 13. Analysing the data from January 1996 through December 2000, 941 non-polio-enteroviruses (NPEV) were typed at the National Reference Laboratory for Poliomyelitis and Enteroviruses. ECHO 30 was the predominant serotype and accounted for 27,1% of all isolates, followed by Cox B5 (11,4%) and ECHO 11 (10,1%). ECHO 30 is also known to be the most frequent enterovirus causing outbreaks or sporadic cases of aseptic meningitis world-wide [4–7]. The 15 most common serotypes accounted for 92,3% of all isolates during 1996–2000. Of the 64 known enterovirus serotypes, 29 were reported during 1996–2000. Only five serotypes have been found in each of these five years (ECHO 30, ECHO 11, Cox B1–3). These serotypes appear to circulate endemically and others circulate in a cyclical fashion with epidemic years followed by years with decreased activity (ECHO 13, ECHO 4). ECHO 13 was not isolated during 1996–1999, however it was the predominant serotype in Germany in 2000 (Tab. 2). There were also notifications of ECHO 13 isolations from The Netherlands (H. van der Avoort, personal communication) and United Kingdom also associated with meningitis . Of the 51,6% of virological investigations with clinical information during 1996–2000, most of the reported diagnosis were aseptic meningitis (45,3%) and gastroenteritis (21,5%). Virus isolates collected at the National Reference Laboratory provide information for detecting major temporal trends of enterovirus circulation in Germany. The consistent presence of certain serotypes among the most frequently detected can be used to focus diagnostic activities in virological laboratories. The most variable regions of the enterovirus genome are within the genes coding for the capsid proteins VP1, VP2, and VP3 which are at least partially exposed on the virus surface. Especially VP1 codes for the major antigenic sites and most type-specific neutralisation determinants. Therefore, this genome region was supposed to be most suitable for discriminating between enteroviruses based on partial sequence analysis and to be useful for molecular epidemiology of enteroviruses . In order to study the genetic relationship of ECHO 13 sequence analysis of a part of VP1 (~300 nt) was carried out. Isolates from different geographic regions were compared to each other as well as to elder viruses (prototype strain DelCarmen from 1953 as well as four isolates from 1965–1986). It was shown that the new isolated strains have a high degree of homology on the nucleotide level (> 98%)) but differ significantly from the old strains (76–85%). Such molecular drift has also been shown for other enterovirus serotypes (e.g. ECHO 4, ECHO 25, ECHO 30, COX A9, ENTERO 71) [10–14]. Specific mutations in the capsid genes can alter antigenicity and neutralization properties of enteroviruses. As recently reported for a variant of ECHO 4 serum pools raised against strains isolated more than 40 years ago did not neutralize the virus . The isolates of ECHO 13 described here could be typed antigenetically without problems. Technical assistance of Heidrun Linke and Ursula Piede are gratefully acknowledged.